In today's energy minded world, it is getting easier and easier to go green at home and reduce your home energy costs. From small lifestyle changes to the latest technology, everyone can step up, reduce waste and save money. Below are just a few suggestions as to how you can improve your home's energy efficiency and reduce your annual home energy bills. One of the best ways to cut down on energy costs in your home is change out older appliances and technology for newer, more energy efficient models. Appliances such as refrigerators, washers, driers and televisions contribute significantly to your energy bill but are rarely upgraded due to their long life span. But in many cases, new appliances can be up to 75% more energy efficient than their decade-old counterparts. So while the initial cost of a new refrigerator may seem high, it will help reduce your long term expenses over the life of the appliance. Another major contributor to home energy bills is lighting. Many homeowners still rely on old-fashioned incandescent lighting which can have a 'warmer' glow but are extremely inefficient. Newer, longer lasting types of light bulbs are now becoming readily available and affordable. Compact Fluorescent Lamps (CFL's) are a cheap alternative to traditional bulbs and can use up to 33% less energy. Similarly, Light Emitting Diodes (LED's) are extremely efficient light sources that utilize a fraction of the energy of traditional bulbs. And when you're done swapping out your bulbs, try turning off the lights when you a leave a room. This will reduce your costs while extending the life of a bulb. A major energy expense for many homes comes from heating and cooling. While many times it is a necessity to heat your home in the winter or turn on the AC during a heat wave, there are ways that we can become less dependent on these energy-hogging systems. The first and most obvious solution is to simply not use them. If it's not too hot outside, consider opening up your windows running a few fans. Fans use a fraction of the energy and can help cool you down. If you have to turn on the AC, try not running it at so low a temperature. Many experts say that keeping the air conditioning at 78 degrees Fahrenheit can help keep your costs down while still cooling your home. Similarly in the Winter, try to resist cranking up the heat and instead maybe throw on a sweater. These simple solutions can help save you money by reducing your energy costs. And when it comes to heating and cooling your home, you want to make sure that you are keeping all of that comfortable air in your home. So be sure to check your home's insulation and plug any leaks in your doors, windows or attic. By reducing this air loss, you can help save on your bills and make your home more efficient. Another investment you can make in your home is to pursue alternative sources of energy. 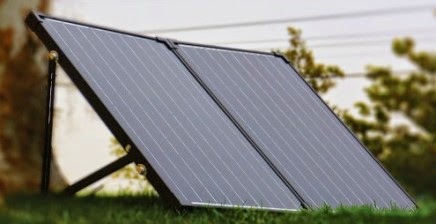 Look into installing solar panels or solar water heaters to help run your home. The initial expense can quickly be paid off with future savings on your energy bills. Going green at home has never been easier or more affordable. By following some of these easy tips and with the energy-saving technology from Renogy, you can start saving on your energy bills.